8 metal pegs and 4 ropes for sturdy fixing. Comes in a small and ultra-light package, suitable for easy carrying and storage. 1 interior mesh pocket for keeping your gear organized. 1 hook on the roof for hanging the lamp or other light stuff. Rainfly can be used separately with the moisture proof groundsheet which is perfect for a picnic, beach tent sun shelter. Features : Extremely fast set up and fold down - only takes 1 minute . 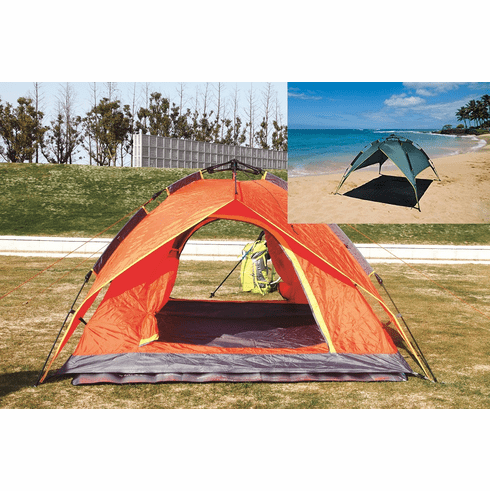 Ideal for camping and outdoor activities. High density and rip-stop 190T polyester rainfly and 150D oxford waterproof ground sheet.